Has anyone ever been to Animal? This is the name of the restaurant that started my journey to the culinary world where I have discovered the finer things in life. I owed a lot to my early experience to the talented duo Jon Shook and Vinny Dotolo, who are the masterminds for introducing me to Animal. Weirdly enough, it took me much longer time to visit their namesake restaurant, Jon and Vinny's. Located in the burgeoning hip Fairfax district, Jon and Vinny's restaurant was a dedication to all dishes Italian. This is where I have a hard time contemplating in wanting to make a visit. Italian restaurants and Fairfax is hard for me to make visits because of parking situation around that part of the town and a few suggested places I can go for Italian nearer to my area (south LA). However, by luck of the stars, I was in the area a few doors down at Sweet Chick and a few cancellation that afforded to me attend. I was a huge fan of the real life chefs of Jon and Vinny. I was mesmerized by their presentations and hard charge in utilizing everything on their ingredients at the Animal restaurant, which was skewered towards American fare with a touch of few European influence. With this place, they left no doubt in that this will be purely Italian. First, when you walked in, the huge masonry stone oven is right in front of the bar counter at the left hand side of the entrance. You can tell they will be taking their pizza task very seriously. Oh yeah, even getting a seat at the counter or trying to score a table without reservation will be mission imPASTAble. Yes, I am working on my puns in on this article. There are 5 restaurants that the duo have involved themselves in that are immensely popular and this place was no exceptions. I chanced on the fact that someone will not showed up. I gladly took a counter seat after a 45 minutes wait when someone didn't showed up for reservation. That person missed out big time in my book. What did I wanted when I entered Jon and Vinny's? Get this... meatballs! I'm sure they will tell me that missing out on their famous pizza will be case, but I just wanted to try their handmade marinara braised beef with the heirloom tomato sauce I had been hearing about. At that weird point of my life, I wasn't going to take things for granted. My gosh, these things were just incredible! With the ricotta sprinkled all over and being complimented with the grilled bread, this was the thing I realized I can't lived without. Supposedly I read somewhere the sauce was made with Bianco DiNapoli peeled tomato, which was from the famed pizza maker Chris Bianco. I would say bravo on this choice. 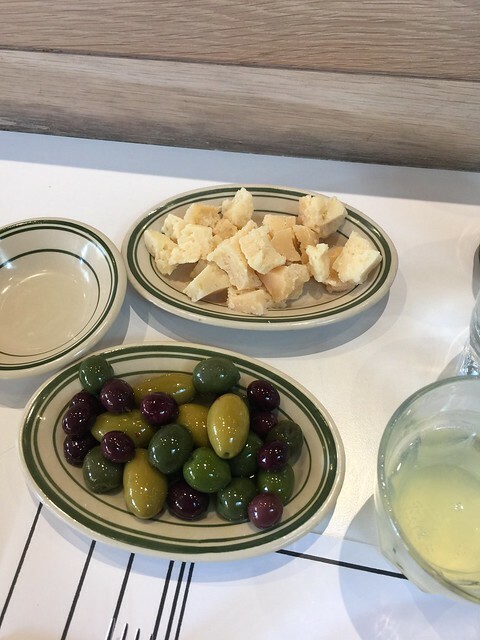 After dabbling with a few olives and cheese on the menu, I was already satisfied. Within an aroma, something made me with that whiff. I sit so close to stone oven and I can see and smell every pizza being assemble and shove to the take-out boxes. Yes, apparently take outs are the big operation at this tight limited-capacity, popular restaurant. For all those that didn't reserved and can't wait for the table, take outs are the best option. Yours truly here decided that giving in to temptations are the benefits to let the readers know whether or not the pizza also lived up to enormous expectation. Without a shadow of doubt, I can't believe that I believed in no carbs diet. This is worth the cheat meal I have been saving up for. Everyone will know that I believe the crust is the important element on any pizza. The charred on the edge of the round crust was phenomenal. For some, it looked burned, but I say the char add more flavor to crust. The Roman Gladiator pizza with every conceivable meat toppings (Bacon, Italian sausage, pepperoni and ham) was a meatlover's dream. 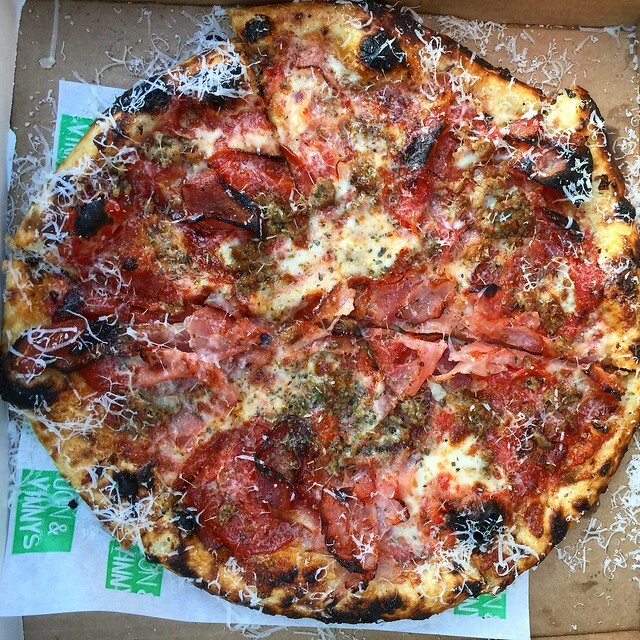 With the crust, this pizza from Jon and Vinny's is now one of my favorite pizza in town along with Spicy Salami Honey pizza. The return trip to Jon and Vinny's will have to include some pasta dishes next time. 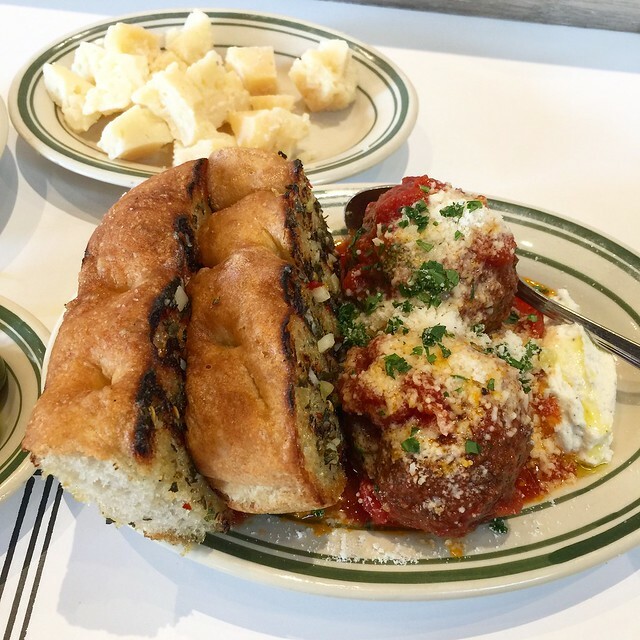 If there is anything you must go for Jon and Vinny's is their meatballs. Seriously, that's something cannot be missed. As in for the guy who decided not to show up for his reservation... a huge thanks from me!